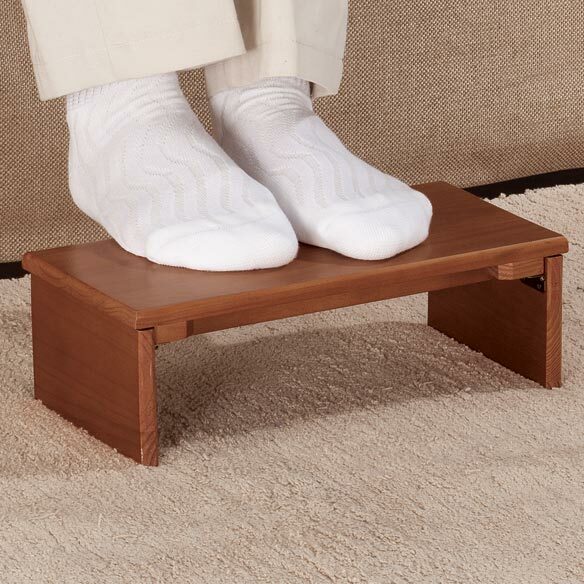 Compact folding footrest by OakRidge™ adds 4” of height to help you sit comfortably. Footrest legs lock into place when open. When you’re ready to go, simply fold it flat for easy portability. Now available in 3 wood finishes to complement any décor. 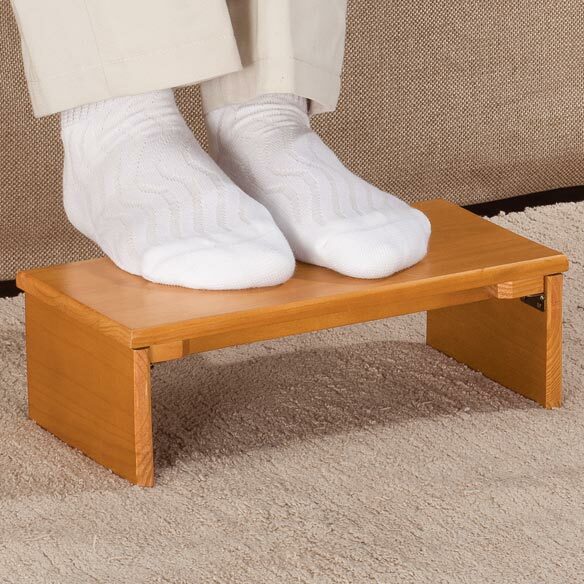 Portable foot rest is ideal for home and travel. Specify pine, walnut or mahogany. Wooden foot stool measures 12”L x 6”D; 1 1/2” thick when folded. I am short. Have a higher than usual toilet. This is the ideal thing to make me fit comfortably. Have given some to others which was greatly appreciated. Lifts legs to a comfortable position. when traveling on bus or train, feet don't reach the floor. Easy to use for this purpose. This is the perfect fix for taking to church and places I need to sit for awhile . . . 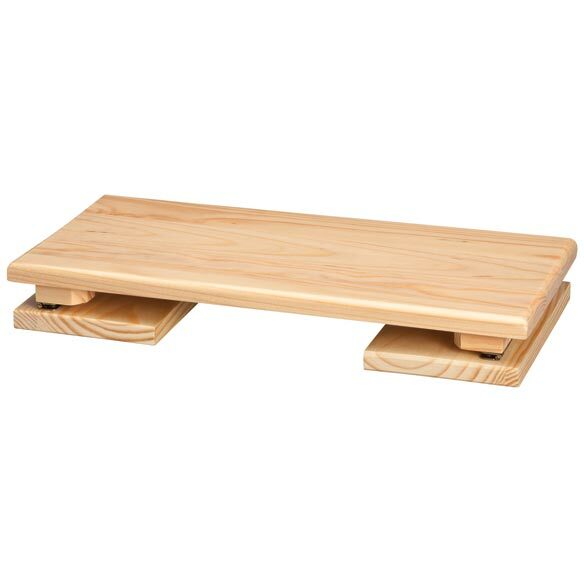 I am always uncomfortable because my feet just don't touch the floor completely . . .Not anymore as now with this little portable "take along step" I can actually sit and enjoy sitting time . . . I am able to stretch my feet forward with so much more comfort and actually cross them at my ankles if I choose . . . wondering why I waited so long to give this light, portable step a try? This is a keeper, light weight, perfect height and easy to take along! Great value for the price, I am buying a second one. Please remind customers that they have to open the supporting brace which is attached by hinges in order to make sure the side legs stay out and the step remains square and supportive. I suspect that the one reviewer who said the side legs didn't stay out did not realize they needed to open the support brace. I have short legs and if I'm sitting in a chair in which my feet don't touch the floor I use this stool to put my feet on. These are affordable enough to have near all your chairs and brings the floor four inches closer to your feet if you need a little help. I have a really crummy back, and when I sit, I feel much better if my feet are propped up. This little collapsible stool fits in my bag and can go with me anywhere. Love, love, love it! Really like it. Works fine. I put this footrest under my desk at work. It is just enough to keep the edge of my chair from cutting off the circulation under my knees when I have to sit for long periods of time. opened and used right away. folds up and easy and light to carry back to car or put in suitcase. takes the pressure off my lower back when sitting in chairs / furniture made for longer legged people ;) LOVE this product! Not a tall person and works well size wise under desk for feet. Just remember to put the brace down under the stool. VERY sturdy. This is a good size because most stepstools are just too high for some things. Also good color selection. Matches my furniture and folds to go under most anything. Can be out of sight when not in use. use it everywhere I sit and to reach the sinks easier. I use it when on the couch, doing my crochet work. Being short, it gives me just that little bit of height needed to do my work in comfort. The only downside of it, was that the bottom is just a bit slick which, keeps pushing it out so, I taped some of that mesh stuff you can use in fridges and drawers to keep things fresh and in place. Other than that, it was just what I needed. I have a small kitchen with one heat vent on the floor and that is the only place to fit a trash can. So I placed the stool over the vent and the trash can on top of it. Great! I get heat and still have a trash can. Well made and so handy to use when you need to reach just 3 or 4 in. higher. If you happen to be just a couple inches too short for the bathroom "throne" its a great comfort to have this little stool handy. very helpful for shorter people. helped my legs from going to sleep in all day meeting. The best sitting position is to have your knees a little higher than your hips. I Like the Footrest very much. I got this for my brother it helps him a lot he is in a wheelchair. Easy to use, and so easy to bring along with me. It's lightweight yet solidly built. I bought this for my husband, who has nerve damage in his back and legs. The footrest is just the right height – not too low or too high – so he can use sitting in any kind of chair, even at a desk chair. The footrest is very sturdy, because of the fold-down cross bracing. I bought this footrest to put under my desk. I'm short and works better than a Styrofoam one I had. That one was round on the top and I found it very uncomfortable. This is roomy but not overlarge. I can comfortably rest my feet on this and do my craft work at my desk. I also plan to use it when I'm sewing. It's amazing how wonderful it feels to flat on something. It takes the stress off my back! Great product and I highly recommend it. It also folds flat for storage. It might be a little big for travel but it's so much more comfortable than my small travel footrest that I might just make the room for it next time I take a flight. I can't find anything negative to say about this. I love it. Needs improvement but still good! My mom bought this for me as a gift. I use it at the desk and at meetings where the chairs are too high for my short legs. Yes, it collapses easily, so I simply stuck on velcro to hold it closed and I face it in a certain directly to ensure no collapsing. But You do need to be sure to secure it when opening it, that will help. I didn't used it but I like the way it is made you can fold it n put it away, the only thing is that it is too short needed it a little higher in height. IGNORE REVIEWS SAYING IT COLLAPSES! I ordered two of these despite the negative reviews saying it collapsed. When I received them, I thought the reviews were right. I was asking my husband if we could add L-braces to keep it open and standing (I didn't care if it folded up, as each was just going to stay in one place). We couldn't figure out what the center wooden piece that runs the length underneath was for. Suddenly, we realized that by turning it, it locked the stool, and would no longer collapse!!! No problems since. It is a FOOTSTOOL for use while sitting only! The stool should obviously come with some kind of directions or diagrams, so people don't think it is a piece of junk - it is not!!! Yes, I have, three times! This is my third! I love them. They are a good height and very portable. However, they are not indestructible. I purchased this stool to help get into bed and to give my feet a resting place while I put on compression stockings. It fulfills its purpose. However, of the two hinges to the stabilizing bar under the platform, only one had a pin to keep it attached to the bar and the platform. Right now, that works, but I'm surprised that a new product was missing a piece. Just received my folding footrest, and was disappointed there was no carrying bag included. Other sites include one. was not all that happy with this purchase. But will use for other decorating purposes instead. I use this footrest at night when relaxing but it is small enough to put away in a closet when not using and takes up little space. Not quit what I wanted, but it works. a step up to bed, needed to be about 2ins. taller. I saw the reviews but figures if the legs would not stay in place, I would ask my building handyman to fasten them. Turns out, I didn't need the handyman this time because the foot stand is very easy to assemble. You just pull out the folded legs and flip up the fastener to hold legs in place. All is accomplished from underneath and I can see how people would overlook that important step and just figure the item is useless. It is not, however now that I have it assembled properly, I will tell you that it does not hold that much weight. It is not a proper step stool or bedside stool. I was looking for a simple low step and I managed to buy this one for such an amazing price in comparison to the others I have seen. This product is very good but just wish it were designed to hold heavier weights. The product was made of a good quality wood, but the legs kept folding up making it useless. I sent it back last Friday and purchased a higher cost product but superior made. Do not recommend. It would not stay in position. It kept collapsing. I also have written this review several times and it was never posted. Good concept, but unit needs to be longer and legs need to lock in place. The "poorly made" statement says it all. I would not buy this product again nor would I recommend it. I couldn't even fix it myself. This product was a great disappointment. I have been unable to use this product which I bought to put my feet on. It does not lock in position but folds up when any slight weight is put on it. I'm still waiting for my replacement of the item I ordered. The original received was of: -Poor quality; -Split wood; -Hinges misplaced..does not allow sides to stand. It was a big disappointment. I purchased this item to help with tieing my shoes, the extra 4 " would help very much as I have a bad back. I'm sending back today because the legs won't lock in and keeps collasping. Not worth the money. Product collapses. I had purchased two.It cost over $13 to return them. Footrest collapses easily. Not made well. Poor quality. Disappointed that I wasted money on this. For the high price this product is awefull.Very poor quality and cheaply made.Its collaspable even when your feet on it.Mine don't even stay up when unfolded. Returning this product. It was not stable. It kept collapsing. I had to return it. I would like a footrest. helps when going to the bathroom; it elevates your feet. My wife is short. She needs something to place her feet on for comfort during church services. I hope this works and is somewhat durable. my legs are short so I need to have a convenient, portable footstool to elevate my feet. feet need elevation during the day. I have been advised to elevate my feet a bit when I sit. I am a disabled senior with very short legs so my feet usually hang in the air when seated. This looks like a great option. I order one and liked it so much had to order another. Super, solid, real wood, sturdy hinges, good work. Needed a footstool. REMEMBER it is NOT a Step Stool. If I could have made one myself I would have!! Short legs, I hope it to be more comfortable sitting. For added comfort in sitting, especially at church. The portability of it is appealing. I am short and use this when seated in chairs that are high. 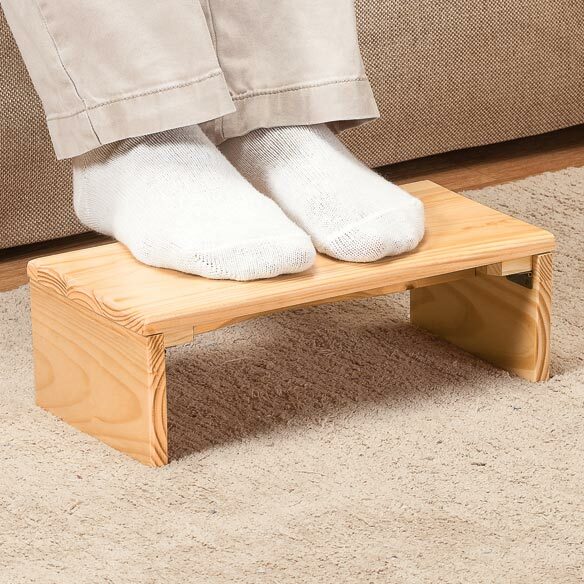 would mainly use this to elevate my feet when sitting at my computer. I chose it for it's size even though several reviews said it was not sturdy enough. To help with back problem. Looks like real wood, and is portable. My mother has lympedema in her legs. She is supposed to elevate her feet when she is sitting. Sometimes she doesn’t want to recline, so this will help when she wants to sit in an upright rather than a reclining position. PERFECT FOR TRAVEL. RECOMMENDED BY A NEIGHBOR WHO CARRIES HER FOOTREST WITH HER ALL THE TIME. For my wife to help her be more comfortable. Most footrests are too high and not that comfortable. I needed one that's just a little bit off the floor. Being 5' 4", my feet frequently don't touch the floor in many chairs. I will use this at home, when visiting and on the plane! With 2 long flights coming up, this should relieve some of my leg pain when sitting for hours. Needed for when I stand at kitchen sink or counter. I'll have one foot resting on it to relieve back pain. which is which? Walnut, mahogany, pine? They are not listed in order. BEST ANSWER: Thank you for your question. Pine is the lightest, mahogany is a reddish and the oak is a medium wood color. We hope this information will be of help to you. Ok. Thanks for your response. What I really wanted was the OAK color, but on-line, that wasn't listed as an option, so I chose "walnut" hoping that it would turn out to be the oak. The other choices given were pine and mahogany. It was a matter of the choices not matching the selections, except for the pine. Anyway, thanks for your reply. The tech person may want to make that correction on the on-line catalog though. I hope the oak one arrives, but I'll be fine with whichever one it turns out to be. Thanks! Where can I see the wood colors? BEST ANSWER: Thank you for your question. They come in pine, walnut or mahogany and you can see pictures on our website of what the colors look like. We hope this information will be of help to you. I would not step on this as it is intended as a foot rest only. The hinges are weak and may collapse. Be careful. Is the hinge 1 long one or 2 on each side? BEST ANSWER: Thank you for your question. There are two hinges on each side. We hope this information will be of help to you. How long does it take for 1 mahogany foot rest take to arrive in Evansville, IN? BEST ANSWER: Thank you for your question. It should arrive in 4-8 business days. We hope this information will be of help to you. BEST ANSWER: Thank you for your question. The Folding Footrest weighs about 1.5 lbs. We hope this information will be of help to you.